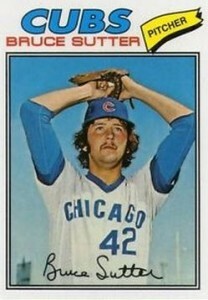 Bruce Sutter was one of the most dominant relief pitchers of his era. 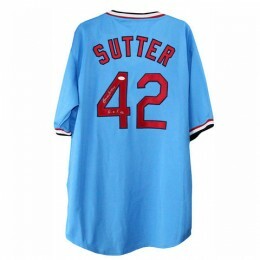 Sutter is a six-time All-Star, a World Series Champion and a Cy Young Award winner. He spent an equal amount of time playing for the Chicago Cubs, St. Louis Cardinals and Atlanta Braves during his 12-year career. Extremely affordable, one could make the case that Bruce Sutter cards and memorabilia are undervalued. It's also a sign of how relievers are largely overlooked. 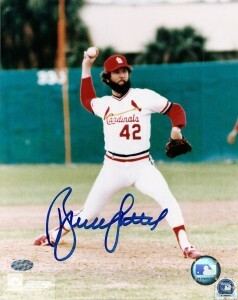 Bruce Sutter's rookie card is from the 1977 Topps Baseball set. He also has two additional regional issues, 1976 Chicago Tribune and 1977 Jewel Grocery. Sutter's first autographed card is part of 2000 Fleer Greats of the Game. It features an on-card signature. The exact print run is unknown and it lacks any serial numbering. His first memorabilia card was not released until 2004 Upper Deck Ultimate Collection. It pairs him with fellow closer, Eric Gagne. The card displays game-worn jersey swatches of each pitcher and is serial numbered to just 25 copies. Sutter's first solo game-used memorabilia card can be found in 2005 Upper Deck Artifacts. It is numbered to 325. Bruce Sutter's autographed memorabilia is very affordable for a Hall of Fame player. He is a regular guest at larger signing events. He has also been a willing in-person signer. This is not a difficult card to find in Near Mint or better condition. When submitted for professional grading, it receives a slight premium when returned in high-grade. Centering is typically the one condition issue seen with this card. 1983? 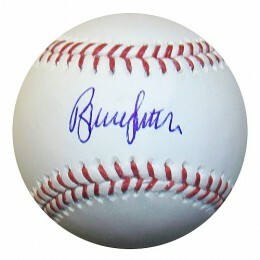 ROLLIE FINGERS & BRUCE SUTTER NIKE "MINI POSTER"
Below you will find an example of what Bruce Sutter's authentic signature looks like. This can be used as a first point of reference for determining the legitimacy of autograph memorabilia, but is not a substitute for having your items authenticated by a well-respected professional autograph authentication company. Some of the trusted sources within the sports memorabilia market include the following companies: PSA, JSA, Steiner, Mounted Memories and Tristar. Click on any of the images below to view full size photos. The signature is written on an even horizontal plane in cursive. The "B" and "S" are larger than the other letters. The "B" is written in a way that the bottom loop does not connect with the vertical line. The "r" and "u" look very similar. The "c" is more vertical than curved. The "e" may show an opeing depending on the type of pen being used. The "S" is discernible as being the starting letter of the last name, but does not look like a traditional "S."
The "t"s are crossed as one. The "e" will look similar to the one in the first name. The "r" is written as a short, angled up and down pen stroke.